You’re sitting around the campfire chatting with your friends when suddenly you realize your dog is missing. Maybe you hear barking, or yelling, from the campsite next door and realize your dog is over there sticking it’s nose where it doesn’t belong. Or maybe your dog has chased after a chipmunk and you’re panicked because he’s not coming when you call his name. Whatever the reason – etiquette or safety – it’s best to contain your dog to your campsite so they don’t run off. So how do you make sure your dog sticks around? There are several options. Note: some of the links below are affiliate links. This means when you click on a link and make a purchase, I will receive a few pennies to help maintain this website (at no extra cost to you). Some of the products have been provided to me to review and share with you, and others I have purchased on my own. No matter how I found the item, I only recommend things we think are really great. This is probably the simplest but potentially the most inconvenient choice. All you have to do is tie a leash to something stable – a tree, picnic table, or an anchored dog tie-out driven into the ground. This option can be inconvenient for both you and your dog for several reasons. First, you could trip on the leash. At the very least, you will probably have to step over it several times while moving around the campsite. Most dogs, at some point, end up wrapping the leash around a table leg or tree. We’d all like to think our dogs are smart enough to untangle themselves but experience tells me that isn’t so. You might end up playing a game of untangle the leash all night. Also, if the dog can get near the fire pit, you’ll have to make sure they don’t drag the leash through the fire and melt it. Still, this method is simple. Your dog already has a leash (you can also use a long-line or tie-out cable to extend their reach… but also the potential for getting tangled up). If you go with the tie out anchor, this “additional equipment” doesn’t take up much space. Pro tip: Placing a carabiner on the end of the leash makes it easy to clip the end of the leash onto something or wrap it around a tree or table leg and clip it to itself – no knots involved. The cable run is a variation on using a leash to tie your dog to something. In this case, you are tying their leash to a cable extending between two trees. This can reduce the chance of your dog getting tangled around things, allow them more space to roam as the leash slides along the length of the cable run, and reduce or eliminate you having to constantly step over the leash. The quickest way to make a cable run between two tress is to use a product specifically designed for that purpose like the Ruffwear Knot-a-Hitch™. The Ruffwear Knot-a-Hitch™ is a campsite dog-hitching system using climbing-inspired components and hardware. 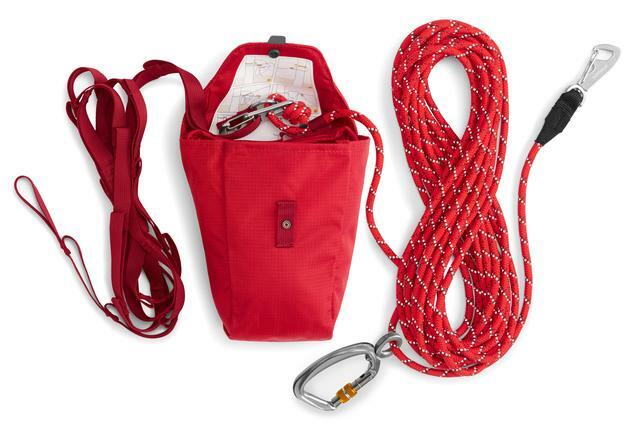 This tie-out system includes a strong, kernmantle rope that can be set up between two trees or secured to a single post using Ruffwear-designed hardware and an easy-to-use tensioning system. I love the Knot-a-Hitch for many reasons. 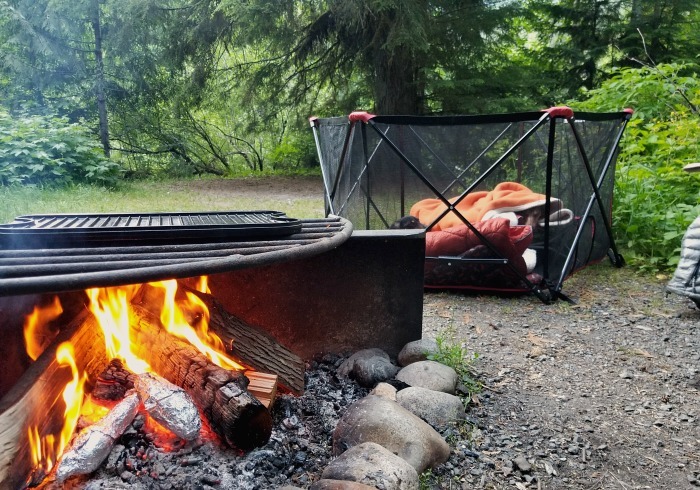 First and foremost, I really like is that I can set it up slightly away from the busy part of the campsite (but not so far away that she feels completely left out) so my dog stays out of the way while I’m cooking or setting up the campsite. That helps to keep both of us safe and happy. Using a crate to contain your dog may be a good option in some situations. If your dog has health restrictions, like a torn ACL or bad back, it can keep them from jumping or moving around too much when they get excited. When Gretel had her back injury and was on strict crate rest, we had to keep her standing and walking to a minimum. We still still wanted to take her on adventures though so we took her crate camping with us. When she wasn’t sitting in our laps, she was in her crate. A crate can also be a good option if your dog gets anxious easily. If your dog sees the crate at home as their “happy place”, they might also find it comforting to climb in their cave when in an unfamiliar situation. Keeping your dog in a crate while at a campground is the most limiting, and can also be the least fun, of containment options though. A dog camping pen, like the Carlson Portable Pet Pen, allows a dog more freedom than a crate but eliminates the issue of the leash getting tangled or your tripping over it. It’s like creating them a little room at the campsite. The Carlson Portable Pet Pen is lightweight, collapsible, and easily thrown in your vehicle. Once you get to your camping destination, all you have to do is pick a spot by a picnic table or camp chair, expand the accordion-like folded structure, and step on the side lock that keeps the pen from folding up on it’s own. The reinforced mesh around the outside creates kind of a fence. Throw a camping bed for dogs, and blanket, in there and most pups will be happy as a clam. To be honest, I don’t know how we managed without our pet pen. Up until about 6 months ago, we used the tie-the-leash-to-something method. Like I mentioned, it was frustrating because Chester and Gretel were ALWAYS getting tangled around something. Chester also fusses less in the pen (because he would fuss and bark if his leash was wrapped around something, which it almost always was). For this reason, myy stress level around the campsite has gone way down since using the Carlson Portable Pet Pen to contain them. Even if you let your dog roam freely around the campsite on occasion, it’s always good to have a plan for when you need to have your back turned or are cooking and need them out of the way. 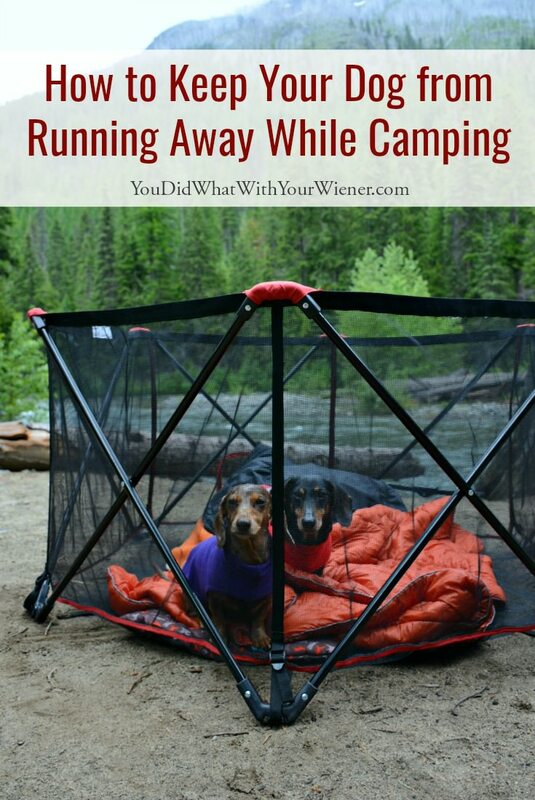 Containment is an important tool when making sure your dog does run off to get lost, hurt, or to harass other campers. What do you use to make sure your pet doesn’t run off when you’re camping? Ahh, how well I remember the days of setting up a tent while Agatha and Christie, and then Shadow, twisted their leashes over tree roots, picnic tables, and their own feet. Such an adventure. The portable pet pen looks like a great option for small dogs. If I were doing it again with a dog with a roaming nose (it takes an act of God to budge Honey from our side), I’d probably toss the folding dog fence in the back of the car. Yeah, the pen is certainly more ideal for small and medium dogs. It can work for big dogs too but a portable pen with higher sides might be better. Having SOME plan in case you need it is good. We recently started using a portable pet playpen while camping. It folds up, has removable floor and removable mesh top. Not as open air as the one shown above but it’s a lifesaver. That sounds a lot like the Carlson Pet Pen but the bottom does not come off. I like it that way because having mesh between the dog beds and the grounds means they don’t get so dirty. Oooh the cable run is a good idea! Luckily I have an Aussie that is practically velcroed to my side, unless there are ATVs around – eek! I bring a couple exercise pens for plenty of room for my doxies to play. Yeah, if you are SURE your dog will stick around, off leash is ok in many circumstances. However, not all so it’s important to prepare and have some kind of containment option available. We haven’t been camping in a while, but several years back we took Linus to the Sequoias. We didn’t have any sort of containment for him and let him roam freely. He stayed close to our campsite, but a couple times he wondered down to the river by himself. One of those times we found him eating something people had left by the river side. I didn’t think too much of it until the middle of the night inside our tent Linus started making gagging noises. He spit up everything he ate at the river side and his dinner, but I’m sure his stomach felt much better. Today we’d use some kind of containment if we took our dogs on another camping trip. I would probably try a combination of the cable run and the Carlson Pet Pen. You bring up a good point. I’ve heard unfortunate stories like yours where what the dog ate was a bag of marijuana and almost died. Letting your dog roam free sounds fun – people don’t like to stifle a dog’s “wildness” – but not knowing what they are eating or sticking their nose in can be very dangerous. I actually developed a product for outings with my shih tzu because he would bolt if not tethered and, if tethered he stayed tangled… so of course that is what I use. However, I think the Carlson Portable Pet Pen is great. It provides room enough for a couple of small dogs and they are still able to feel a part of the campsite activities. My friend is using the Wrapsit on her vacation right now 🙂 You might know her pup – Montecristo Travels. That Cable Run Between Two Trees is a great idea! I always leash my dog near the campsite, although I also wan to let him have more time exploring around. “You might end up playing a game of untangle the leash all night.” Already been that situation. Sometimes i do feel like, for whatever reason, the dog will come to his master when the name is being called. But the bad thing is, you cannot smell the danger or any risk that your dog will take. Yes i admit sometimes, i just take for granted and never tied a leash at all. By the way, i like the idea about create a cable run between two trees, but need to be lucky to find that kind of place while camping. That’s a cool idea Trevor. I’d never heard of that one. My dog recently injured her back and is also on strict crate rest for the next 4 weeks. I had planned to camp with her next week and had thought I’d have to call it off. Just read your post and now I’m wondering if a laid back camping trip with her may be possible if I keep her crated at the campsite. How did you manage with your dog when you wanted to do any day activities? Is camping with a crate restricted dog really feasible? Hi Jen. We took Gretel camping when she was on crate rest for IVDD so it IS possible but there are a few important things to think about. First, where is your pup in her recovery? By the time we took Gretel camping, It had been at least 4 weeks but I think closer to 6. More importantly, she started getting better (less pain, etc) from day 1 so it had been a long time since she was in pain. Also, how calm is your pup? She’ll need to stay in her crate at the campsite all the time just like she would at home. Would she be ok with that even with the stimulation of the outdoors? I knew Gretel would stay calm and sleep in her crate peacefully most of the time. As far as managing her when I wanted to do activities, camping WAS the activity. She’ll need to be closely supervised at all times so you won’t be able to go on hikes or walks away from the campsite. It can be risky, more or less so depending on your circumstances, so I say do it if you want but be vigilant. Definitely talk to your vet and get some of the pain and anti-inflammatory medication (like what they gave her in the beginning) to take with you, and know where the closest vet is, just in case something does go wrong. Good luck. I like the cable run between two trees the best. That way the dog has a chance to move a bit and have some freedom. Good stuff. We lived in a motorhome for a couple of years, and spent a lot of time in campgrounds. We mostly saw people (with small dogs) using those paneled, foldable, wire fences that you fasten together to make an octagon-shaped pen. We now use one to keep our mini-dachshund contained on our patio and plan to take it when we go camping. Those definitely can work but I find them annoying/difficult to use if you are just setting them up for the night. Mostly because they are so heavy and take up so much room in the car to transport. I can definitely see them being useful if you are in one place for weeks at a time though.